FOR close to four centuries, a tiny hamlet, 65 kilometres northwest of Vadodara, has been producing some exquisitely crafted chairs and tables in just two colours — maroon and gold. To orthodox Gujaratis, these pieces of furniture are supposed to be auspicious and, ideally, ought to be gifted at weddings. Alas today, but for two falias (clusters of houses), Sankheda does not produce such furniture. And the families engaged in keeping this age-old tradition alive have long surrendered to market pressures and are more concerned with "made to order" and "melamine finish" pieces, than retaining the purity of their art. In effect, Sankheda furniture is now available in a variety of colours — from black, blue and green to the currently popular ivory, copper, silver and burgundy. These ‘new colours’ may not be as durable as the traditional maroon and gold, but with demand for them mounting, nobody seems to complain. "When men and their tastes can change, why can’t the furniture?" reasons Kiranbhai Suthar, a craftsperson who has been exporting Sankheda pieces to Europe and West Asia for the past 15 years. "People buy furniture to match the interiors of their homes. We have no problem meeting their demand." Other prominent craftspersons in the village are Babubhai Motilal, Pravinbhai Mistry, Jayeshbhai Mistry and Kishorebhai Suthar, who have made it big in the business. "In the past we have experimented with many colour combinations, but nothing really worked," informs Kishorebhai. "The present colour scheme was introduced four years ago by Dwarkesh Kalidas Mistry. He is no more, but his colours have survived." Dwarkesh is regarded almost as a patron saint in the village and many families actually worship his photograph before setting out to work every morning. He happened to be the first university graduate in Sankheda and what is more, he had obtained a degree from the Denmark Academy of Fine Arts! It goes to Dwarkesh’s credit that chemical pigments were used for the first time, in place of traditional organic dyes and crushed kevda leaves as a colouring base. While this raised the options on the palette, the practice of using tinfoil patterns with transparent lacquer coating remains unchanged. 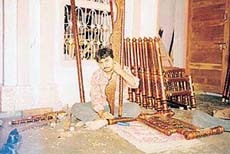 "Basically we are producing the same furniture that our forefathers used to," insists Babubhai. "The style and decorations are all the same. We don’t compromise on the wood. We use teak. The lac, agate stone and glue are no different from what was used earlier. It’s only that we are offering more variety in colours." There is another difference. The Sankheda craftsmanship is not restricted to making household furniture. A whole range of decorative artefacts from wall-hangings, pedestal lamps, flower vases and pen stands to beautiful toys, rolling pin for the kitchen and supports for hammocks are produced from the village. "Many may fault us for compromising our art for the marketplace," comments Jayeshbhai, another fine arts graduate and a nephew of Dwarkesh Mistry. "But to us it is a question of expanding our customer base. If Picasso was to be in our place, he would have done no different." Adds Kishorebhai: "All this accusation about compromising art, is nothing but idle talk of city-bred, educated people. We are unlettered and our only concern is to feed our empty stomachs. In fact, the less the education, the better it is for the artisan!" But then, when it comes to tracing the origins of wood-crafting in Sankheda, even a child is aware of the legend of the saint from Champaner. The holy man, ecaping Mughal invaders, had taken refuge in the hut of a lowly wood-cutter in the village. The latter looked after the saint for 110 long years and then, suddenly lost sight of him one day. That very night, as the legend goes, the wood-cutter saw his guest blessing him in his dream and making him a skilled carpenter. Overnight, the man became a gifted craftsman, carving out furniture with the characteristic lacquer coating.